The film is actually quite charming with some good comic elements, a great voice cast, including Danny DeVito as the animated villain Mr. Swackhammer, Billy West, and more. The film also pokes fun at all of Jordan’s affiliates and sponsors throughout and showcases his basketball career in a great way. Jordan plays himself who has left the NBA for the MLB, which he isn’t exactly doing great in. Meanwhile, on a distant planet to Earth lies an animated planet where Mr. Swackhammer (DeVito) runs an amusement park named Moron Mountain, where business is slowly declining. Mr. Swackhammer enlists his henchmen to kidnap all of the Looney Tunes, including Bugs Bunny, Daffy Duck, and the rest of the gang, who live in the center of Earth to be attractions against their will in Moron Mountain. 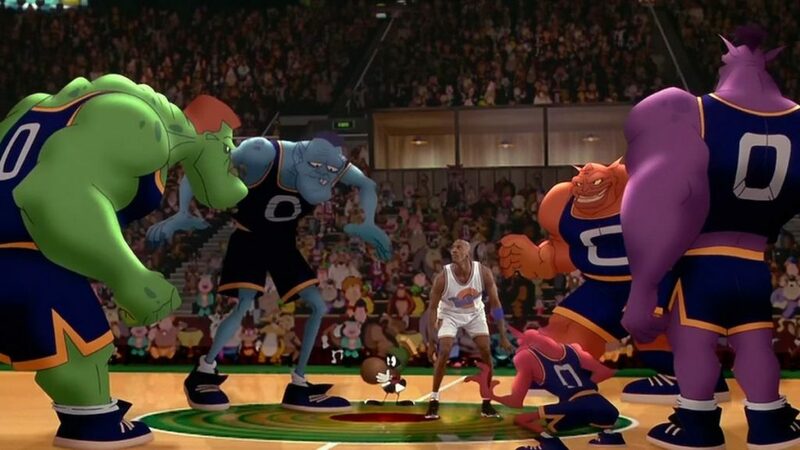 For some reason, the Looney Tunes and Mr. Swackhammer’s henchmen challenge each other to a basketball game to resolve the conflict, but Mr. Swackhammer’s people steal the talent of most of the big name NBA players. Here is where the Looney Tunes kidnap Michael Jordan to teach them to play basketball with the help of Larry Bird and Bill Murray, as Newman, I mean Wayne Knight tries to juggle Jordan’s day-to-day activities. Yes, this is the synopsis that comes complete with R Kelly songs. 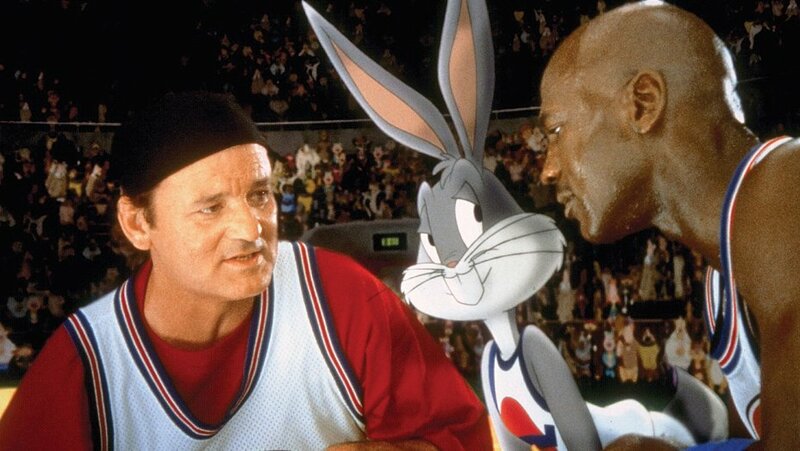 The film itself isn’t that great nor is the acting of Michael Jordan, but just seeing Jordan in his prime have fun with a bunch of antics with the Looney Tunes is quite fun and nostalgic, but loses its appeal fast the older we all get. That all being said, the film is fun for the whole family and should hold up for a new generation of young kids you want to discover the Looney Tunes and Michael Jordan. 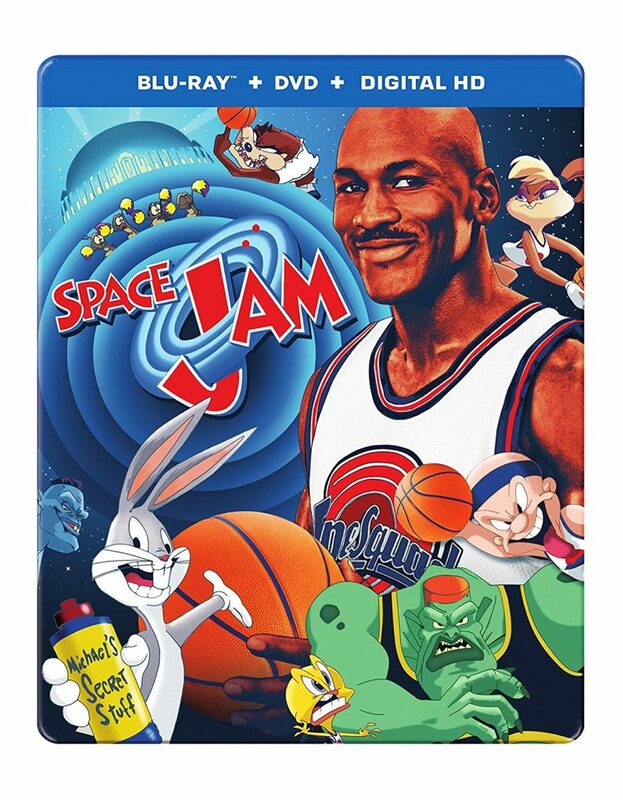 This 20th Anniversary of ‘Space Jam‘ comes with a 1080p HD transfer and is presented in 1.85:1 aspect ratio. Sadly though, this is the same exact disc that was released over fiver years ago, which looked good back then, but unfortunately does not do anybody any favors right now. For a 20th anniversary disc, I expected a new transfer that would keep with the ever changing times, but that’s not the case here or steel case here. (sorry not sorry). Most of the film is very soft and not sharp or vivid in the detail department with the exception of closeups of human faces in well lit exteriors. In those shots, the beads of sweat, wrinkles, and facial pores stand out nicely. Other times, everything just looks soft from the wide shots to the closeups. The animated Looney Tunes have a haze around them the whole time and never look sharp, giving way to an old school style of animation. It was kind of distracting and didn’t mesh well with the live action that well. Colors are warm and muted without tons of realistic bright vibrant colors popping off screen, which is confusing at times, because the Looney Tunes are very colorful. Things just look a bit stale here. Black levels have some crush and aren’t always deep and inky, but the skin tones are for the most part natural. There were no physical damage to the print and noise, aliasing, and banding are kept to a minimum. I just wish there was a new transfer here. This release comes with a great lossless DTS-HD MA 5.1 mix where something is always going on around you. The track is zany, crazy, chaotic, and tons of fun, as the Looney Tunes always bring the silly sound effects to immerse you in their fun world. Sound effects are full, robust, and sound off all the time. The basketball scenes definitely give your speaker system a work out with all of the chaotic yells, cheers, ball bounces, and more. The score and soundtrack by the laughable R Kelly always sweeps the soundscape and will make you die with laughter. Dialogue is crystal clear and easy to follow and free of any pops, cracks, hiss, and high shrills. Needless to say, this audio presentation is better than the video above. Audio Commentary – Director Joe Pytka along with Bugs Bunny and Daffy Duck deliver the commentary track. Unfortuantely, it’s not that fun and rather irritating as they try to make you laugh, besides talking about making the film. Jammin’ With Bugs Bunny and Michael Jordan (SD, 23 Mins.) – This is a vintage featurette that talks about the Looney Tunes and working with Michael Jordan. There isn’t really anything of value here. Music Videos (HD, 9 Mins.) – Music videos for ‘Hit ‘Em High’ and ‘Fly Like an Eagle’. 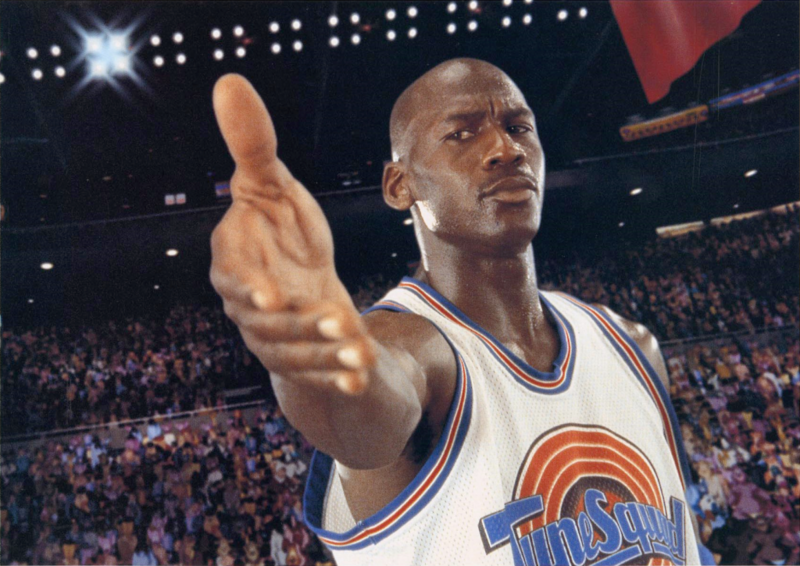 No, ‘Space Jam‘ doesn’t hold up after twenty years, no matter how much we all loved it back when we were much smaller and loved Michael Jordan playing basketball with the Looney Tunes. There is a nostalgic element here, but it doesn’t last the whole movie, even if the beloved Bill Murray and Newman is in it. This release is the same exact release from 2011. There is nothing new here other than new packaging and a DVD copy with the digital download code. For being a big 20th anniversary of the film, I thought we would have new features or new transfers, but that’s not the case here. So, if you don’t have the previous releases and you loved this film, you’ll want to pick it up. Other than that, feel free to skip it. RECOMMENDED IF YOU DON’T ALREADY OWN! This entry was posted on Sunday, November 27th, 2016 at 3:39 pm	and is filed under Film, News. You can follow any responses to this entry through the RSS 2.0 feed. You can skip to the end and leave a response. Pinging is currently not allowed. « Blu-ray Review: ‘The Infiltrator’! We have to keep out faith in the Republic. The day we stop believing democracy can work is the day we lose it. Let's pray that day never comes.